Finally broke down and ordered one after arguing with myself for a couple of years. Today I received my Ranger II. I immediately took it to the range and ran several of the .45 Colt 225 JSPs through it. I was pleasantly surprised that they recoil was no where near as fierce as I was expecting. It was really fairly pleasant to shoot. I think loaded with 410 buck it will be an excellent companion both in the vehicle and on my belt for long walks. Thanks for a quality product! Finally got the chance to shoot my Old Glory. I was really impressed with the accuracy. I was able to consistently hit a 8" plate at 30 yards shooting with 38's. The 410 was shooting 10 inches at 5 paces with #4 shot. I bought the driving holster and the clip on holster. They were a real tight fit. Left the pistol in them for a week and now they are just right. Very nice gun that is easier to carry than my subcompact Springfield XD 9mm. Much more up close destruction power. Doctors can't sew sausage back together. Still keep my XD close by in the car. Both have their advantages and disadvantages if you should be unfortunate enough to have to use them. Old Glory is a well built very rugged pistol and very attractive. Highly reccomend it! One evening after my wife Barbara and I returned from a walk she nearly stepped on a copperhead snake next to the house! I went inside and loaded my Bond Arm Texas Defender with 410 shells and came back out and shot it. I snatched up the snake and walked to the end of the property to dispose it and came upon two more. 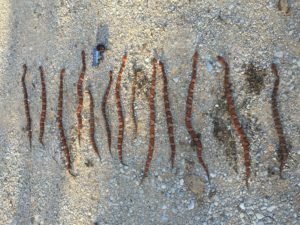 I shot another then went back in the house and grabed a handful of shells then shot the other snake. After shooting the 3rd snake I realized there was two more then another and another! By the end of the evening I shot 13 copperheads with my Bond Arms and the next two nights I shot 3 more. I like this gun! A Bond Girl At Last! one for my own birthday and couldn't wait to try it out! Bond Arms Bullpup9 DAO is my pistol of choice from now on! Thanks Gordon and company for making this Bullpup a reality! Winchester Defend 147 grain JHP which shot flawlessly. My husband and I shot about 75 rounds with not even one failure, misfire or jam! I am a recent convert to Bond Arms. The reason is, I wrongly held the belief that derringers were dangerous and pretty much useless for self-defense. That is until I handled my first Bond Arms derringer. Bond Arms offers a thoroughly customizable and modern take on a historical firearm, while being true to it's aesthetics and by adding safety features that now makes these derringers a viable option for every day defensive carry. Moreover, it's .410 shot-shell capability and ability for the shooter choose from a wide array of different swappable barrels in many different lengths and calibers along with many grip and holster choices, all serve to make Bond Arms derringers a top choice for an EDC. As with all firearms it takes some practice to use a Bond Arms derringer well. 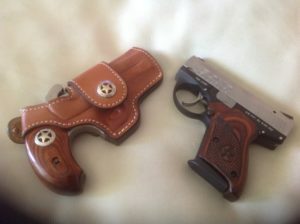 But oh what fun it is to practice with a firearm that takes you back to the days of Bat Masterson and Wyatt Earp that offers 21st century performance, quality and versatility. If you like to shoot, run to your dealer and pick up a Bond Arms derringer. Make your shooting buddies jealous!! I've been looking forward to getting one of these guns for a while. The mechanics are outstanding. Like closing a car door on a Mercedes Benz to a Chevy Citation, only it's the "American" product that embodies the precision and craftsmanship. I went from a Springfield XDs, to Glock's 42 & 43, to M&P Shield and now I think this Bullpup is my keeper/carry!! Feels great, shoots great and the size is perfect. I use a Sticky Holster in the center back carry. Perfect. I respect products that are made well and the tolerances on this gun are crazy. Job well done folks. Buy American!! I am a very proud owner of the Bond Arms Rustic Ranger, exclusive to Cabelas sports store. I love to take it to the range to try out all my new barrels. Also to show it off. Everyone loves it. You can see and feel the quality in this beautiful gun. Now I have just tried out my new Bond Arms Bullpup. I waited a long time for this gun, but the wait was worth it. The quality can also be seen and felt in this new gun. The best slide action I have ever used. I just shot 200 rounds from this new Bullpup and loved every shot. The double action is soooooo smooth. I worry about my wife trying it. I may have to buy another one. I know the cost was a little more than other firearms, but the quality will be enjoyed many years. I am very proud of these two quality firearms. Thank You Bond Arms! P.S. Those who complain about the price, have never held this gun in their hand. I recently bought my very first Bond Arms product. I have been reading about them for months and finally decided to buy one after watching every video on your website and online. I selected the Ranger II and ordered it and had it sent to my local gun store that does not currently carry Bond Arms Products. When I was fillling out my paper work everyone in the store wanted to look at my new Ranger II. The gun store manager even wanted to shoot it on their gun range. I am so pleased with the quality of your product and am proud to be the owner of such a fine piece of craftmanship. I can't put it down. And the holster that came with gun is also fantastic. The fit is perfect and just enhances the gun even more. Even though I have a concealed carry permit, I have never found the right gun to carry, until now. It is the Ranger II. 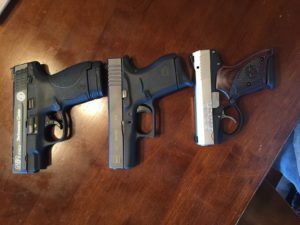 I have been collecting guns for years to pass on to my two boys as a inhertance. I have never wanted to buy two of the same gun to add to the collection until now. I am trying to decide on my next Bond Arm purchase so each of the boys will have one. What will be my decision, Ranger II, Texan or Patroit. One son is a Border Patrol Agent so I think he should get the Ranger II. My other son is a disabled Army veteran injured in Afganistan. So I am thinking the Patroit should be my next choice. Everyone that is researching or considering a Bond Arms purchase, do not hesitate in your decision. Pick any one they offer and you will be elated with the quality and design. Thank you Mr. Bond for creating this product and starting a company to build and offer it to the gun buying public. This new pocket 9mm, the Bullpup, is as small or smaller than most pocket 380s. The fit and finish is every bit Bond Quality. To say it is well built is an understatement since it has been designed and built with precision. The action is smooth and light beyond any semi-auto I have ever tired. The trigger is double action but there is no creep or drag of any kind. The trigger is smoother than any revolver or semi-auto that I have ever handled. At a glance the barrel appears to be 1/2" but is just over 3" with over 4 3/4" sight radius. This combination gives it target accuracy. I have fired over 500 rounds of 115 gr FMJ Flocchi ammunition and Hornady 135 gr Flex Lock ammunition. If all of these features are not good enough, I saved the best for last. The magazine holds 7 rounds of 9mm, is made of all steel with a coil spring and black hard plastic base. I have shown many people the magazine (loaded and empty) and they all reacted the same way: Oh My! I have never seen anything like this. They load so easy. 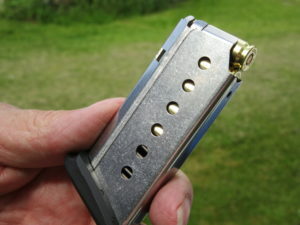 The best thing I can say about this pistol is that if you think the Bond Derringer is good, the Bullpup is even better! I have wanted one of these guns for many reasons, but the main reason was for its western look. I just had to own one because I love westerns and guns! This gun Is a work of art! Pure quality! I got more then just a awesome conversation piece. I was very impressed when I went outside and fired a 3 inch 410 shot at a milk jug from about 10-15 feet away and sent the jug rolling. I was expecting the recoil/kick to be way much more then it was. Now I can't put the darn thing down. 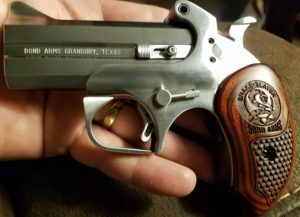 Now I want to add the 357/38 barrel to my new Cowboy Toy! I can't say enough about the quality, workmanship, and beauty of this awesome firearm!